The International School of Oman was established by EDUGATES® International in September 2008. Initially KG to Grade 7, the school will offer classes through to Grade 12 from the 2013-2014 academic year. The staff of the International School of Oman is a body of international teachers from countries including Lebanon, South Africa, United Kingdom, Canada, Jordan, Egypt, Oman, Romania and the Philippines. EDUGATES® International was established in 2001 in Lebanon and in 2009 in the UAE, although members of the company have been involved in teaching and education management since the 1970’s in educational institutions in the UK, Lebanon, Oman, Jordan, New Zealand, Qatar and the UAE. The company partners with educational authorities, investors in educational projects and schools to raise the quality of education for the communities they serve and hence ensure sustained national development for an increasingly global citizenry. The team has diverse backgrounds and experience in both local and international contexts and thus EDUGATES® reflects a synthesis of best practice. In addition, the company has the advantage of relevant, long-term, successful educational experience in the GCC and Middle East. Members of the team have continuously accompanied the growth and development of education in this region since the 1980’s, and share the cultural background of its people. EDUGATES® vision is “to create successful educational institutions that provide the world with educated citizens who nurture virtue and create prosperity”. EDUGATES® mission is “to raise generations who possess the knowledge, skills, values and awareness that ensure their well-being and success”. 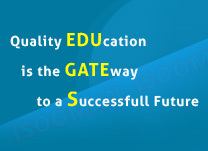 EDUGATES® values are “wisdom, integrity and diligence”. Schools, such as ISO, which are managed by EDUGATES® have the benefit of the company’s comprehensive system of education based on a US curriculum and taught in both English and Arabic, with a third optional language. It is a system which promotes local cultural values and meets the demands of the international community. Students are prepared for university entry to national and international colleges through the national examinations of the host country and international examinations such as SAT, TOEFL and AP’s. Students are raised to become well-rounded, world citizens with qualities that enable them achieve their full potential, face the challenges of the future, make significant contributions to their chosen fields, and enjoy their lives. EDUGATES® main office is in Al Ain, with a further location in Dubai. It can be reached through its website: www.edugates.net.